As all of you start your journey in Jianghu, we wanted to give a few protips as well as some links to guides we've released over the months to help get you on the road to becoming the ultimate kung fu master! Firstly, let's talk Equipment. In all, your hero can equip different types of gear onto your body in much the usual way - hats for your head, chest armor for your upper body, and of course the occasional trinket/necklace for that added power boost. Besides this, there are 2 slots for weapons - a Main and a Support slot. It is not necessary to have a weapon in both of these slots, but your character will need at least one of them filled in order to fight. Now that we've got that covered, let's talk about Skill Sets. A Skill Set is a combination of combat skills that you can equip at any given time. Each Skill Set includes basic attacks, blocking and feinting attacks, and of course your powerful "Rage" ultimate skill. 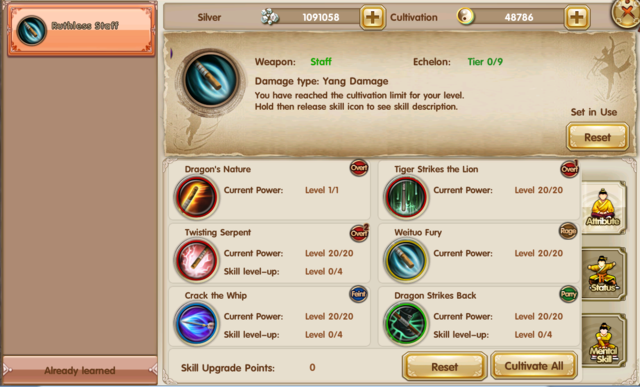 In order to use a specific Skill Set, you will need to also equip the related weapon. So for example, let's say you are a Shaolin warrior, and you want to use the Ruthless Staff skill set. The Ruthless Staff skill set is a "Staff" set, which means in order to use this skill, you'll need at least 1 of your weapon slots to have a staff equipped. When you join a School, you'll receive a specific weapon and skill set for that school. The Shaolin, for example, will have a bowstaff, and will learn the "Ruthless Staff" skill. All schools have their own Skill Set to start out with. While reliable, these sets aren't particularly powerful, and you will undoubtedly want to work towards acquiring more powerful Skill Sets in the future. Which brings us to learning new skills. Be they Internal Skills - which once you learn you can equip to get massive added attributes like HP and attack - or Martial Skills - which as we said are the basics of combat - in order to learn a new skill you will need to collect scroll fragments, and combine them into a scroll from which you can learn. 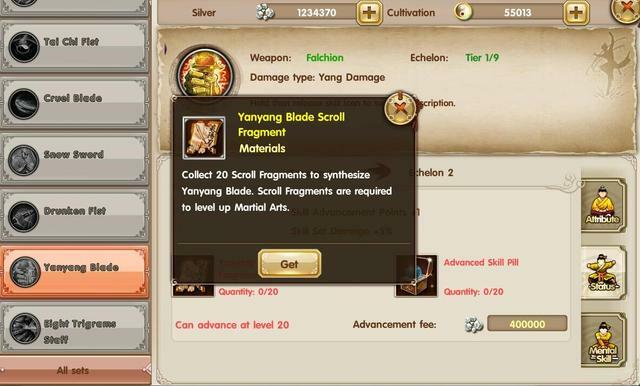 There are lots of ways to get scroll fragments - they are in fact one of the main rewards you can get for completing activities like Jianghu Adventures, Endless Dungeons, and School Raids. If you want to find out where to find a specific skill's Scroll Fragments, find that scroll in your inventory and click on it. Once you have, click the "Get" button, and you will find a list of all possible sources of that fragment. Hope all of this helps! To help you along the way, here are some more handy guides we've released in recent months. For more questions, please post on this thread! so does it mean, the schools only give you your starting skillset, and regardless of your chosen school, you can learn other skillsets once you complete Scroll Fragments? so it's possible to learn the skillset of a staff user if you started using daggers? Absolutely! All it requires is that you collect the appropriate scroll fragments. Now obviously if I'm an Emei, because of the School activities like School Spycraft and School Raids, I'll have an advantage gathering the fragments for, lets say, the Departing Sting, which is a dual dagger set that they start out with. 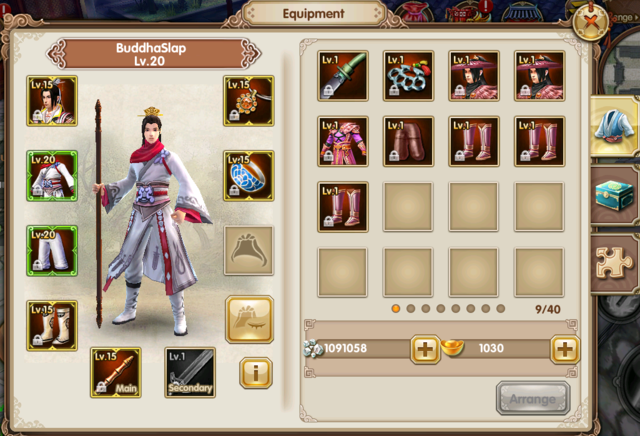 However, if I want to, I can also gather shards for the Ruthless Staff (Shaolin School skill), and I can learn that. Also, many skills are not specific to any one school. The skills are all color coated - the copper colored School skills at the lowest, followed by silver colored Martial Arts skills, gold colored Jianghu Skills, and lastly jade colored Ancient Scrolls. All sets above the School Sets will require you complete other game functions like Jianghu Adventures and Endless Dungeons to acquire. oh, thanks for the explanation..
one last question (kinda out of topic) is there any chance that they will implement a cross-server pvp mode (or any rumors)? I feel there should be a little bit of a warning on this guide also. If you are trying to develop a skill set that is from another school, the maximum lvl you can get the skill up to is 5. For example, non Tangmen players can only get Vipers sting up to lvl 5.
i see, so school internal arts will make all the difference. that's why i keep on reading things about "fake/imitation" build. i wish they add in a cross region PVP mode. then that character will be used to do cross-region PVP, and perhaps just add in suffixes after their character name to avoid duplicates. then by the 15th and 30th of the month, ranking refresh, the performance on PVP will be rewarded. should also have a website to show current ranking ladder across all regions. same will be done on GvG mode. i hope they consider this idea. yup, you can collect the other scroll fragments from the other schools - either from school raids, wulin myth, endless dungeons, etc.